Lil Ms Money Bags (#1), under jockey Vince Guerra, races up the rail to win the Grade 3 Mile High Futurity Sunday afternoon at Arapahoe Park. AURORA, CO�AUGUST 18, 2013�Second fastest qualifier Lil Ms Money Bags broke on top and flew up the inside rail to win the Grade 3 Mile High Futurity Sunday at Arapahoe Park. Simply Tapalpa finished a neck off the winner while getting the nod over A Sonic Zoom for second. Ridden by Vince Guerra Lil Ms Money Bags completed the 400 yard task in :19.676 seconds, a 97 speed index. She picked up the $46,647 winner's take of the $109,110 purse. John Hammes conditions the homebred daughter of leading sire PYC PAINT YOUR WAGON for Lisa Beauprez, Thomas Bradbury and Thomas Bradbury, Jr.
A Colorado-bred filly from the Streakin La Jolla mare Bits Of Bliss, Lil Ms Money Bags is 2-2-0 from eight starts and has earned $56,362. She kicked off her career at Remington Park in March before moving to Arapahoe where she was also a finalist in the Rocky Mountain Futurity last month. Still a maiden after four attempts, Simply Tapalpa earned his black-type Sunday afternoon and picked up $21,822 for owner Juan Escobedo. 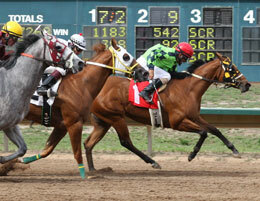 Jaciel Soto rode the gelding for trainer Gerardo Herrera. Joaquin Vega bred the 2-year-old in Mexico. A Sonic Zoom earned $13,093 for his third place effort under jockey Brian Theriot. Howie Chavers, Jr. trains the colt for owner/breeder Jean Chavers. It was the first stakes appearance in four starts for the Colorado-bred. Zoom Macho Shroom, Our Dashing Lorenita, Ikanshazom, Bf Storm Chaser and Hardhitting Sawyer completed the field. Fastest qualifier Midori N Smoke was scratched.